Robert Anton Wilson’s 203-page mindbender, Quantum Psychology: How Your Brain Software Programs You and Your World, is more than meets the eye. The subtitle suggests a self-help book, and it appears to be just that in many respects. But twenty pages in, one realizes that there is no labeling this one. It is a psychedelic mix of pop-science, psychology, philosophy and politics all rolled into one. And if that doesn’t sound crazy enough, the book comes with exercises at the end of each chapter to be performed as part of a group-read. Wilson tells the reader throughout the book that he or she will gain much more from it if the exercises are actually performed. One of Wilson’s fan sites – http://www.rawillumination.net – joins readers together to discuss the exercises in a chat forum and, surprisingly, most are completely appropriate for remote participation. 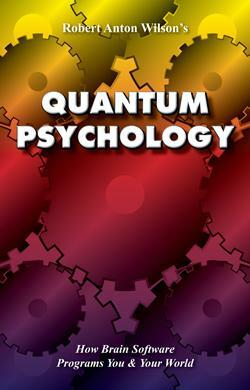 Quantum Psychology is divided into five sections. The sections begin with an analysis of how the brain actively filters information pulled from the external world, and Wilson’s attempt to get us to “step outside our minds” to acknowledge this subjective process. As the book moves on, physiological and psychological systems the body’s hardware and software are explored, and a detailed discussion of the intricate “feedback loop” connecting the two morphs into a discussion of how you can actually reprogram them. Much of the material is Wilson’s extension of Dr. Timothy Leary’s Eight-Circuit Model of Consciousness, which is a kind of trippy roadmap of the brain and all of its component parts. As the reader works through each section, the connection between them becomes apparent. The common thread that runs throughout each section is this: Your brain perceives the world in ways that are unique to you, and many times, that perception is filtered, consciously or unconsciously, through an ideological lens. Wilson urges readers to attempt to view the world with the understanding that this lens exists, and that nobody else’s “reality-tunnel” is filtered through an identical lens. Much of the world’s conflict, Wilson says, stems from people disagreeing over whose perceived reality-tunnel is the correct one. Once one is aware of his or her own special gloss on the world, communication with others becomes more meaningful. via Center for a Stateless Society » Psychology for Anarchists.